One of my favorite 3-day weekends of the year with President’s Day, particularly because of the annual Southwest Stakes from Oaklawn. Many eyes toward Louisville in May with 10 Kentucky Derby points going to the winner (10-4-2-1). Several in the race already have Kentucky Derby points in part because of the Smarty Jones Stakes, won by Far Right. Far Right returns as the 3-1 M/L favorite in the Southwest. He proved himself better than Bayerd and Private Prospect last time out. That said, there are reasons to be hesitant about him. I’m not sure he’ll love the extra half furlong and Ron Moquett — an otherwise very good trainer — doesn’t win Graded Stakes. He only cost $2,500 originally, although Robert LaPenta bought a 1/3 share in him after the Delta Jackpot. Far Right could be a horse of a different quality, but I’d rather see that first before taking action, especially on a likely favorite. Mr. Z. was clear and going home but then was all over the place in the stretch. Given that he’s experienced, I’ll take it as tiring very badly; Jon Court seemed to go to the whip a bit early (although it is a notoriously short stretch in the 8f route at Oaklawn.) Even though the addition of Nakatani is notable, I still don’t like him today. He has all the signs of a horse that’s already peaked. War Story is interesting, but Amoss horses typically show who they are pretty quickly. He could be fast enough to get it done here today, especially if he takes to the surface. A blistering workout on the 11th is encouraging, but the 11 post is going to be a challenge. It’s a close enough race that post could make a difference. You’ll hear a bunch about the Todd Pletcher-trained, Donald Dizney-homebred JS Bach coming out of a dominant maiden score at Gulfstream. I typically don’t like the maiden to Graded Stakes move for inexperienced horses, but understand the motivations for it. On the contrary, I don’t mind the maiden to Graded Stakes move as much in the case of Kantune, who already has 7 starts under his belt. He really took the Oaklawn surface — both in the morning and afternoon — after struggling in California. He’ll go the same distance over the same track as his lifetime best today. He’s 15-1 on the morning line and is fast enough to get it done. 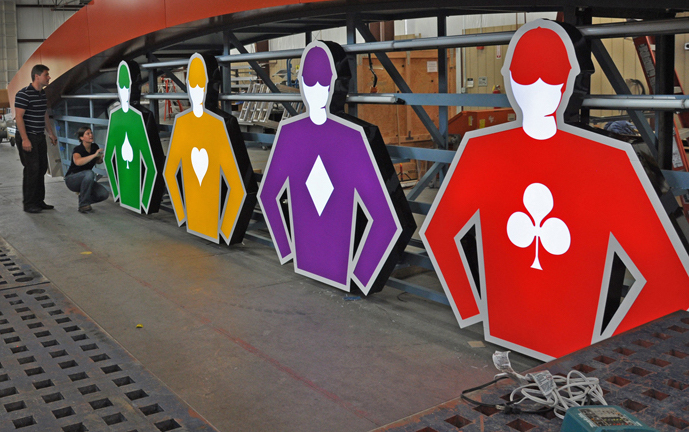 Kentucky Derby points start to rise with the Risen Star from the Fairground next week. Be sure to check the Kentucky Derby Trail page for replays and more. Image: I-5 Design and Manufacture, Copyright 2009.